As the saying goes “at breakfast feast like a king” and that is exactly what we would love you to do. That is why we place huge importance on setting you up for the day ahead. In great weather imagine breakfasting on our patio overlooking our garden with the early morning sun just starting to warm. Kick off with our special Columbian blend of coffee or our range of teas or even hot chocolate. Tuck into our buffet starter selection of cereals, fruit juices, fresh fruit salad, yoghurts or pancakes. Whilst you are enjoying this we will be preparing your individual cooked breakfast order and we will serve it to your table. 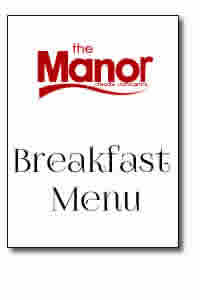 At the Manor, we pride ourselves on using the best local ingredients which is why we source the pork for our breakfast sausages and bacon and our free-range eggs from local farmers.